Mr James Delingpole is a fool. He was probably always a fool but there was a time when I counted him as a friend and I was too polite to tell him. He would ring me up occasionally for brief discussions, and sometimes he'd ask me to write for his disgusting publication - for which I was never paid. All this was some time ago and, as he has followed in the path of the Brexit "ultras", we've lost touch. I ignore his publication, just as – quite evidently – he ignores mine. Last week, though, he made a special fool of himself appearing on Andrew Neil's This Week to talk up the merits of a no-deal Brexit. Completely unprepared to defend his case, he came badly unstuck, provoking a less than favourable commentary from our Pete. But such is the nature of the beast that he is now back, publishing in his own defence an article in which he proclaims: "I'm right – Brexit on WTO terms is going to be just great for Britain". Normally, we would ignore hubris of this nature from such an ineffable lightweight, but there is an interesting social phenomenon here, where somebody who is so comprehensively wrong about a subject, can return to it only days later, to prove himself even more ignorant than during his first attempt, while declaring himself absolutely right on all counts. Perhaps, if no-deal was a person, like Melania Trump, we would have Breitbart apologising and paying substantial damages, rather like the Telegraph, that custodian of measured reporting, upholder of Leveson's "powerful reputation for accuracy". But, as a mere political issue, the likes of Delingpole can play fast and loose with it, deliver the most unmitigated trash by the way of argument, declare victory and move on, basking in the fond applause of the clapping seals who make up so much of his audience. 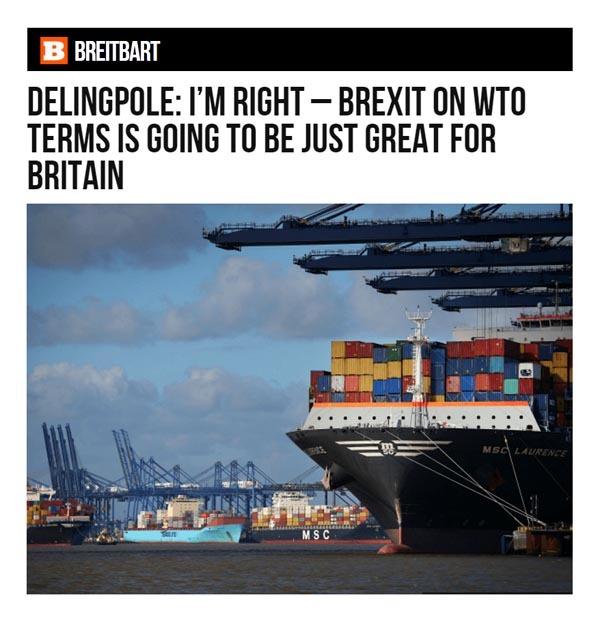 And, with the benefit of his having spent most of the weekend boning up on the WTO, we find Mr Delingpole staking his reputation on the claim that "most world trade is done on WTO terms". Also, he says, "the vast majority of the UK's trade with countries outside the EU is done on WTO terms, and it would be illegal for the EU to impose punitive tariff barriers on the UK, much as it might like to". This is where I would really like "no-deal" to be a Melania Trump figure. With the number of times we've seen this canard published, the various claimants would have paid out billions in damages. The claims about most world trade being done on WTO terms, and UK trade with countries outside the EU being done under WTO terms, are completely false. The thing is that I've been writing about this in detail, long before the referendum, with a piece about China published in May 2015 - nearly four years ago. It was there that I referred to the EU's own treaty database and pointed out that, to set the framework for trade between China and the EU, there were multiple agreements - 65 over term, including 13 bilateral agreements. These ranged from agreements on trade and economic co-operation to customs co-operation. At issue here is that, while these agreements are trade-related, none of them are formal free trade agreements (FTA), devoted to tariff reductions, and registered with the WTO. And because there are no FTAs as such, we get pundits assuming that there are no agreements at all, on which basis it is assumed that trade is being carried on solely under WTO rules. I made this point with greater force in May 2016 in respect of the United States and the EU, pointing to 38 EU-US "trade deals", of which at least 20 were bilateral. That was at a time when the great sage Charles Moore was writing that: "The EU has never yet, in its history, had a trade deal with America". Interestingly, that same year when I was working with Owen Paterson, Moore wanted to write an article about UK energy policy, featuring Paterson's views. At Owen's behest, Moore thus telephoned me at my humble abode to take down, almost verbatim, my research data on energy, on which he relied for his article. Thus, as long as my work had the stamp of approval from Owen, it was kosher enough to use – not so my well-founded work on the WTO option. This contradicted what Moore wanted to say, so it was ignored. Similarly, Delingpole used to ring me up in a flap when he needed information for an article he was writing. But, surprisingly enough, I've heard nothing from him over the WTO no-deal controversy. This is something of a pity as he would have benefitted greatly from a round-up piece I wrote in March 2017, and more so from my Monograph on the WTO option which was published in July 2016. And, on the same day, I'd written another blogpost on the subject, quoting none other than Pascal Lamy. Crucially, I also cited a US State Department report on foreign trade, which declared: "The United States and the 28 Member States of the EU share the largest and most complex economic relationship in the world", thus enabling transatlantic trade flows (goods and services trade plus earnings and payments on investment) averaging $4.3 billion each day of 2013. But, these days, this is not how the same is played. For Delingpole to make his case, he must select his own sources. Clearly, the US State Department is not good enough, so he relies on the far more prestigious source (in his terms), the report authored by Peter Lilley. That says what Delingpole wants to hear, so it becomes his source of choice. It's in the nature of living in a complex world with far too much information to sift that we tend to contract out our expertise to preferred specialists, much as in days of yore we might have chosen our favourite knights to represent our cause in the lists. If you can't be bothered to do your homework on this issue, just take it from me: this is one of those issues not unlike global warming. There is a vast, well-funded Establishment determined to protect its interests at whatever cost — even to the point of getting lots of "prestige" figures (economists, heads of big business, etc) to tell barefaced lies about the imaginary disasters that lie ahead if we don’t do what they say. No, you start with primary sources and work your way in. On the one hand you have the WTO website and the EU notices to stakeholders or you can choose to believe a pack of Tory cronies all of whom rely on a single source who tells them what they want to hear. But then, Pete might have spent more than a weekend learning about the WTO, providing an interesting take - another source for the likes of Delingpole to ignore. We cannot win at this game of trading prestige – but neither do we want to. If that's all the other side has got, then it has already lost the argument. Delingpole can declare his little victory, but if he believes his own propaganda, he's an even bigger fool than I take him for.